Now that Easter is over, you might have a bunch of those plastic Easter eggs left and you’re not sure what to do with them. I hate that I have a bunch of them too – but I succumbed several years ago when the bright colours and fun designs called out to me and I wanted to make my daughter’s first Easter egg hunt super exciting. Sigh. I too have given into the temptations of consumerism and mass-produced products that are no good for our environment. There are MANY other ways to reuse plastic Easter eggs – so here are just a few to get you started! 1 – Make special Easter story eggs. If you want to talk about the religious story behind Easter, Stacie from Motherhood on a Dime put together this “Resurrection” Eggs activity that is great for preschoolers and kindergarteners. A nice way to revisit the story every year and reuse the materials over and over! 2 – Use for storing small things. Depending on the size of your eggs, they can be great for storing individual jewelry items to they don’t get mixed up and tangled, especially if you’re traveling. Or how about craft beads? You can even colour coordinate! A person with OCD’s dream! Other ideas for things to store: buttons, loose change, bandaids, small screws, etc. 3 – Make a garland. Some plastic eggs already have holes in them, so they’d be easy to string together to make a garland you can use year after year. 4 – Use them for kids party games. The old balancing the egg on the spoon and racing game is always a classic party game. You can put something inside the eggs to give them some weight and double as little treats or favours for kids. 5 – Use them for homemade playdough. With eggs that don’t have holes in them, they’re perfect for storing homemade playdough (another idea for colour-coding!). 6 – Make shakers or maracas. Plastic eggs are perfect for filling with rice, pasta, beans, or beads to make egg shakers or maracas. 7 – Make mini hot air balloons. I love how adorable these are! Mini hot air balloons are perfect decorations for any kids room. So fun! 8 – Make play tea cups. Ohhh, these are so so cute! Buttons, and decorations transform old plastic eggs into new beautiful tea cups! 9 – Decorate and embellish them. There are tons of ways to decorate eggs with fabric, twine, glitter, stickers, washi tape, etc. This post from Tip Junkie has loads of ideas, including a very pretty Easter egg wreath. 10 – Make mini planters. I may actually use this idea for giving out Easter gifts to my daughter’s classmates next year – I love the mini planter idea for little succulents. 11 – Make light-up fireflies. These would make perfect nightlights and summer fun nights. Very cute! 12 – Make Easter egg birdseed ornaments. This is a lovely idea with spring in the air – birdseed ornaments! 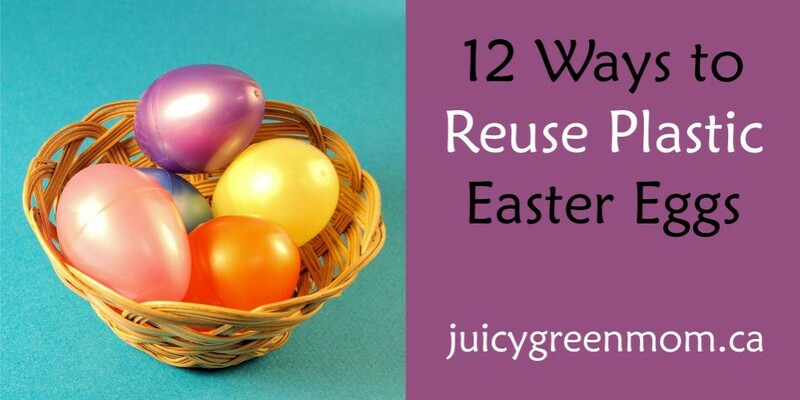 For more ways to reuse plastic Easter eggs, check out these posts from Twiniversity, Inhabitots, Spaceships and Laser Beams, ApartmentTherapy, and PopSugar. 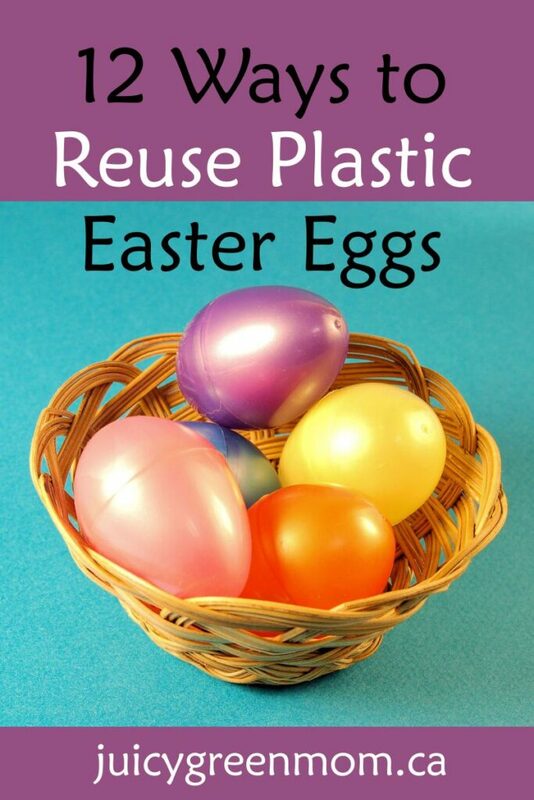 What’s your favourite way to reuse plastic Easter eggs?